Finally, there’s the art of tying one on. From the most basic drape to the overhand knot, here are four knotting techniques that even novices can pull off. The drape: For a casual affair when color trumps warmth. Best with: A wool scarf, whether it’s solid, plaid or striped. How to: Uh… drape the scarf around your neck. The overhand knot: A dressy look that’s ideal for a night at the theater or a black-tie affair. Best with: A patterned, medium-length scarf. How to: Lay scarf over the shoulders. Cross one side over the other, then pull up through the loop. Adjust the front side to smooth out. The slipknot: A great everyday look that provides warmth and flair. Best with: A cashmere scarf goes well with this European-style knot. How to: Fold the scarf evenly in half. Drape around the neck. Tuck the loose ends through the loop and tighten as desired. The twice-around: For the office or sporty occasions, like when tucked into a leather bomber. 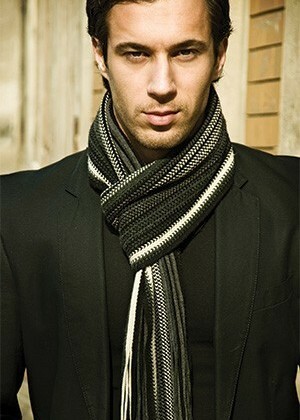 Best with: This romantic style is best with a scarf 72 to 90-inches long made from a thin material like silk. How to: Wrap twice around the neck with the two ends in front.